We combine the latest and most effective technologies and process knowledge with years of experience, to provide maximum waste reduction and cost savings while minimizing safety and environmental concerns. Mech-Chem concentrates on helping your company meet, and then surpass, EPA, OSHA and NFPA regulations and your own environmental, health, safety and fire protection standards in a way that improves your bottom line over the long-term. 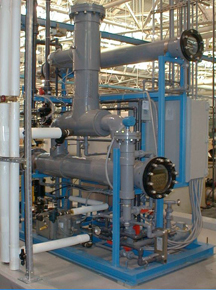 Mech-Chem's knowledge of chemical engineering and processing, along with our industrial experience in the design and start-up of these operating systems, gives us the unique ability to design and build fully integrated systems. This expertise allows us to provide our clients with effective processing systems using the best available technology with state of the art PLC/PC automation and controls. Please choose your area of interest from the left or below to find out how Mech-Chem Associates, Inc.'s design and engineering expertise can help you with your process design requirements, waste handling problems, personnel safety, and environmental responsibility.